Table tennis can be a tricky thing to practice when you don’t have any help. 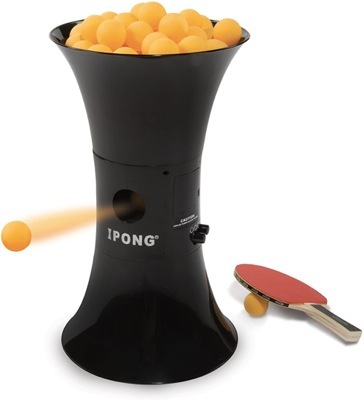 Thankfully there is the IPong for those of you that don’t have anyone to help you out with those practice sessions. It’s a very funny looking device, but it’ll send out as many little yellow balls as you need to keep your ping pong paddle moving. It’s very similar to a tennis ball machine, it just happens to dish out ping pong balls instead. By turning a handy little knob you can select one of 3 spin settings. There is the underspin, topspin and finally the heavy topspin. The trainer will hold 110 balls and even has an adjustable speed dial that can dish them out from 12 to 70 per minute. You can pick one up through Hammacher Schlemmer for $149.95. The iPong now comes with a wired remote control too and you can fully adjust the level of spin instead of just 3 positions!